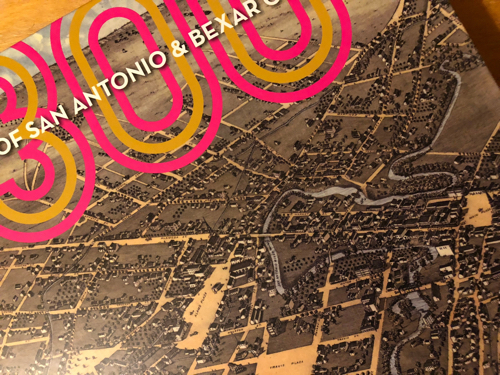 In a few weeks the City will begin construction on a walkway through the heart of Miraflores, the historic garden of Dr. Aureliano Urrutia, constructed from 1921 to 1940 on 4.5 acres just below the headwaters of the San Antonio River. The walkway will restore both east/west and north/south pathways to form a continuous artery from the entrance at the Brackenridge Park pedestrian bridge to the entrance at the Hildebrand gate. “I’m excited that the City Council is moving forward on this project, which will allow citizens access on a limited basis to see what a jewel this garden is,” says Lynn Osborne Bobbitt, Executive Director of the Brackenridge Park Conservancy, a non-profit organization that provides stewardship for Brackenridge Park, of which Miraflores is a part. The work, Phase IV of a number of recent improvements to the garden, will highlight a bronze statue of Urrutia, given to him in 1940 by a grateful patient from Mexico City. Urrutia placed it at the center of a 36-foot reflecting pool and constructed around it an “outdoor room” with a brick walkway encircling the fountain, surrounded by “walls” of trees and shrubs. The restored circular walkway in this area will utilize original pavers, which currently lie buried beneath the surface. The pool itself also is buried, with the exception of its exposed edge, and will remain so for the time being. New trees will be planted to restore the sense of the garden room. The original driveway, coming in from the Hildebrand gate will also be restored, and will no longer be used as a driveway, but as a grand tree-lined walkway of decomposed granite. In its heyday, Urrutia used Miraflores as a private garden, as well as a place to entertain friends and community. He also allowed organizations to use the garden for various celebratory occasions. With a price tag of approximately $350,000, City Council approved this phase in December 2016 under recommendation from the Historic and Design Review Commission. The architecture firm of RVK provided plans for the walkway project, based on a 2008 Master Plan, which was approved by the Texas Historical Commission. Alpha Building Corporation, a Minority/Women Business Enterprise, is contractor for the services. Previous work on Miraflores includes the pedestrian bridge built from Brackenridge Park (2009), a Dionicio Rodriguez sculpture and a palapa restoration provided through a San Antonio Conservation Society grant (2011), and improvements in conjunction with flood mitigation, including restorations of a Rodriguez pedestrian entrance gate, the larger Hildebrand Gate entrance with replacement of some of its tile murals, and rebuilding of the perimeter stone wall along Hildebrand (2015). Miraflores was acquired by the City of San Antonio in 2006 as parkland, and is the unique garden expression of Dr. Aureliano Urrutia, who came to San Antonio from Mexico City in 1914. The garden contains a number of significant objects reflecting important aspects of Mexican history, art and culture; some of which are on the Smithsonian Inventory of American Sculpture. It is on the National Register of Historic Places (2006), and is a State of Texas Archeological Landmark (2009). Historical photo from the archive of Elise Urrutia. Or scroll down to the bottom of the page and sign up for future updates.